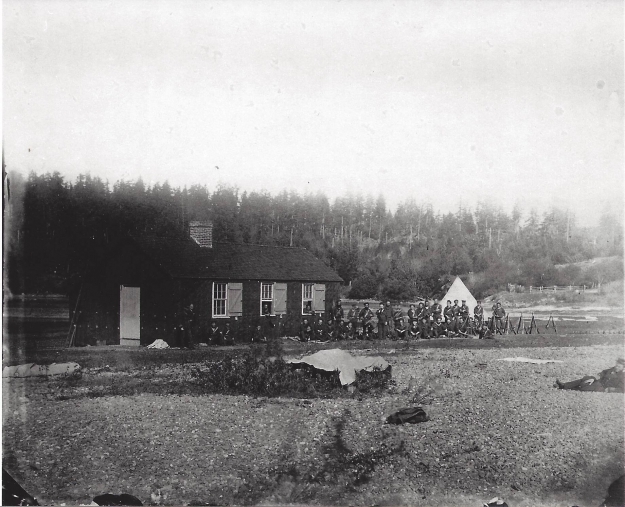 In 1854, when the naval base was established in Esquimalt, the Coburg Peninsula was reserved as a rifle range but with the influx of settlers to the area following the gold rush in the late 1850s, the area also saw other industrial developments. By 1860, the land around present day Fort Rodd Hill and Hatley Park was owned by David Cameron. Cameron had become the first Chief Justice of Vancouver Island in 1853 and entertained many Naval Officers and prominent colonialists at his home, which he named Belmont. In 1860, a sawmill was built on his property at Spring Vale, which was the name given to the area around Cottonwood Creek, the Creek that runs through what we know today as Charlie’s Trail. 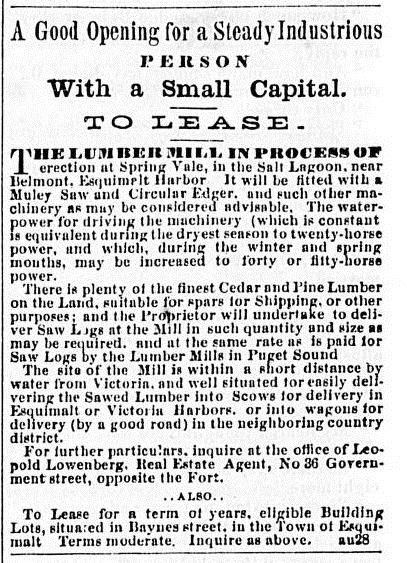 The position of the sawmill was important as it would have taken advantage of the year round high water pressure generated by the falls along the stream, as well as the abundance of forested land and easy access to shipping routes beyond the lagoon. It was advertised for lease in the local newspapers, described as “Driven by water, power being equivalent to about 20 horses…” The mill was said to be connected by a substantial tramway to a shipping wharf in the salt water lagoon and the rental agreement included 400 acres of heavily timbered land which the lessee would have the privilege of cutting. In 1868, the lease was held by the Gilmore family, according to the city directories of the time. Excerpt from The British Colonist, August 30, 1860, p.3. David Cameron’s mill was a productive one while it was in operation. Arthur Harvey’s Statistical Account of British Columbia, 1867 lists Cameron’s saw mill, valued at $20,000, with a daily capacity of 15,000 feet. 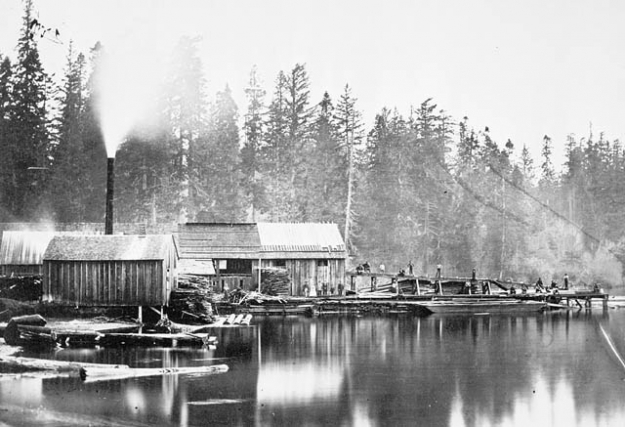 Although there were several other lumber operations on Vancouver Island at the time, and several other small scale operations existed nearby such as the Muir saw mill in Sooke, Cameron’s mill was surpassed in production only by the Alberni Mill at Barclay Sound, which had the capacity to produce an immense 100,000 feet per day. Image credit: Library and Archives Canada, MIKAN no:3371987 - John Muir's sawmill at Sooke. Ca. 1860-1870. Fred Dally photographer. In 1871, the mill was converted to a factory producing boots and shoes. It was managed by a man named John Switzer and several people were employed at the site. The company was very successful and eventually a waterwheel powered, three story building existed on the spot where the mill once stood. On the ground floor, tanning of the hides took place in large vats, the second floor was used for dyeing and the third floor was for manufacture of the boots and shoes, as well as leather belting required for machinery. Hemlock bark required for the tanning process was shipped by scow from Muir’s saw mill in Sooke and then brought by canoe across the lagoon. By 1879, the company had expanded to include a factory in Victoria at Yates and Langley Streets, which also had a storefront on the ground floor. In 1883, the tannery’s site covered 540 acres around the lagoon, including a farm, and was known for being very well appointed with modern labour saving machinery and a producer of highest quality leather in large quantities. The tannery remained at Belmont until the mid-1880s, and in August 1889 the farm and property was sold to Roland Stuart and Charles St. Aubyn Pearse, who renamed the area Hatley Park. The name was retained when the Dunsmuirs bought the property from Roland Stuart in 1907.